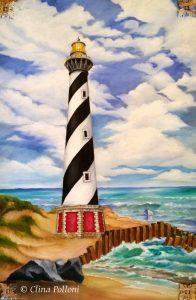 The Cape Hatteras Lighthouse is an original oil painting by Clina Polloni. 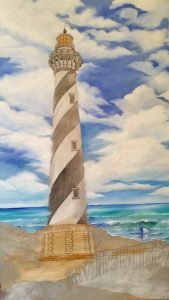 Cape Hatteras Lighthouse, the tallest in the United States, stands 208 feet (63 m) from the bottom of the foundation to the peak of the roof. Protecting one of the most treacherous stretches of the Outer Banks, NC. Oil on Canvas 24”x 36”. Start by drawing the lighthouse in its original place. Do your under-paint or imprimatura with a wash of acrylic gold and silver. Acrylics are very good for under-painting because they dry faster. They create a worm color that once you put the oils in the top, they look brighter. Using oils, start painting the sky, ocean, sand and stones. Using oils paint the lighthouse.